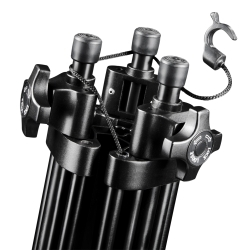 Stability and sturdiness in connection with comfort and compactness: These are properties of our video tripod series Dolomit! 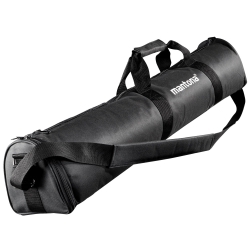 A smart panhead ensures fluid and precise movements, robust legs ensure stability. In a word: A perfect basis for professional ideas! 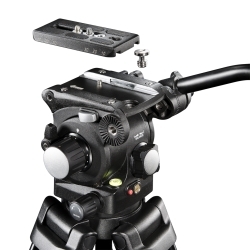 The video tripod Dolomit 3200 with its height of approx. 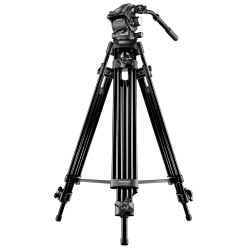 156cm is ideal for use with video cameras and DSLRs with a weight of up to 8 kg. The long pan bar supports flexibility in use. The possibility of mounting the pan bar on the left or right side of the panhead is a particularly convenient, depending on whether you are right or left handed. With the integrated and even illuminated bubble level exact levelling is no problem. 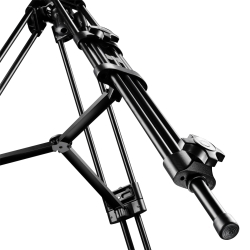 The tripod made of a high-quality aluminium-magnesium alloy ensures the required stability. The quick-release fasteners are easy to use and enable simple and quick height adjustment. Double-guided legs and the mid-spreader additionally increase stability.